There is something about winters and the winter-spring cusps that automatically tends us towards desserts. As Indians, we are spoilt for choices too. From gajar ka halwa to the wholesome moong dal ka halwa or the chewy pinni or the decadent patishapta, there is so much to pick and choose, and we are not complaining. Malpua is one such winter-spring treat we can never say no to. Malpua is an Indian pancake-like-dessert which is made of rice flour in oodles of ghee and sugar syrup. The traditional sweet has been a festive staple since eons. For the longest time in Indian households, Malpuas were associated with something celebratory or was prepared when there was a good news or someone was visiting home from far abroad. Popular across North and Eastern regions of India, Malpuas history goes back to the ancient Vedic times. Some food Historians also dub the sweet dessert as one of the oldest desserts of the subcontinent. Parts of Bengal, Bihar, Orissa, Nepal and Bangladesh prepare the dessert for various festive occasions. Malpua is part of the Sakala Dhupa or morning food served to the lord Jagannath at the legendary Jagannath Temple in Puri, Orissa. Malpuas along with Patishapta are an intrinsic part of Poush or Makar Sankranti celebrations in Bengal. Malpuas are also prepared in Odia homes during Raja sankranti. Malpua is also an illustrious part of ‘Chappan Bhog’served to Lord Krishna on Janmashtami and Govardhan Puja. Various sweetmeat shops and confectionaries prepare over a 100 kilos of Malpua every day, and most of it gets sold like hot cakes. The deep fried pancakes soaked in a sugary syrup, goes back 3000 years in time. Several Vedic scriptures make note of ‘apupa‘ which is said to be the earliest form of Malpua. 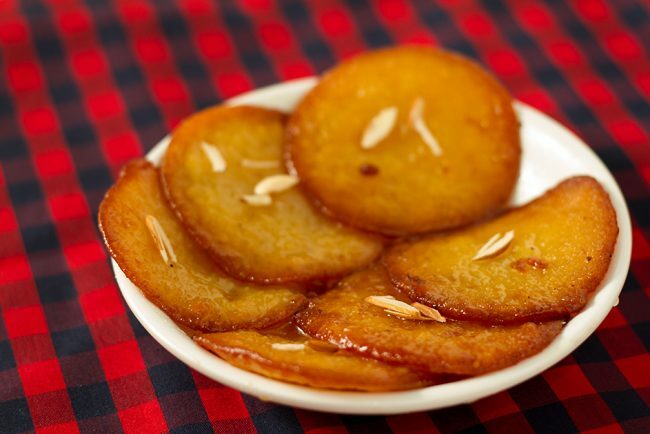 Apupa was a sweet cake where barley flour was either fried in ghee or boiled in water, and then dipped in honey. Barley was one of the most highly regarded grain consumed by the Aryans. Rice and wheat came much later. With the coming of the Buddhist it underwent other variations “with broken rice it was known as kanapuvam”, Achaya notes. Achaya further writes that pua and Malpua of Modern Bengal are evolved variants of Apupa. Even Appam for that matter derives its name from the Vedic Apupa. While traditional preparation of malpua only consists of flour and thickened milk which is fried in ghee, that’s how they prepare Malpua for Posh Sankranti in Bengal. But there are several variations of Malpua. Many preparations used crushed ripe bananas, or pineapple in the batter. Some often chose to top their malpuas with condensed milk, nuts and cardamom. In Odisha, the Malpua is dipped in syrup after they are fried. The Bihari version of this dish has sugar added to the batter prior to frying. Here is a simple recipe of Malpua that can help you churn some delightful ones for yourself, that too in the comforts of your own kitchen.